When did Anneliese begin to experience strange symptoms? Epilepsy may have been the cause of Anneliese Michel's demonic hallucinations. In 1968, when she was 17 and still in high school, Anneliese began to suffer from convulsions. Court findings have her experiencing her first epileptic attack in 1969. It was then that a neurologist at the Psychiatric Clinic Wurzburg diagnosed her with Grand Mal epilepsy. Soon, Anneliese started experiencing devilish hallucinations while praying. She also began to hear voices, which told her that she was damned. The court determined that by 1973 Anneliese was suffering from depression and considering suicide. In 1975, convinced that she was possessed, her parents gave up on the doctors from the psychiatric clinic. They chose to rely solely on the exorcisms for healing (washingtonpost.com). Anneliese's symptoms have since been compared with those of schizophrenia, and they may have responded to treatment (telegraph.co.uk). Who first diagnosed Anneliese as being possessed? The first unofficial diagnosis was made by an older woman who accompanied Anneliese on a pilgrimage. She noticed that Anneliese avoided walking past a particular image of Jesus, and that she refused to drink water from a holy spring. The woman also claimed that Anneliese smelled hellishly bad (washingtonpost.com). An exorcist from a nearby town examined Anneliese and concluded that she was demonically possessed. After two failed requests, the rite of exorcism was finally granted by the Bishop. Was Tom Wilkinson's character of Father Moore based on a real person? The movie's Father Moore was based on Father Arnold Renz and Pastor Ernst Alt. Tom Wilkinson's character was more a combination of two real-life people, Father Arnold Renz and Pastor Ernst Alt (shown at left). 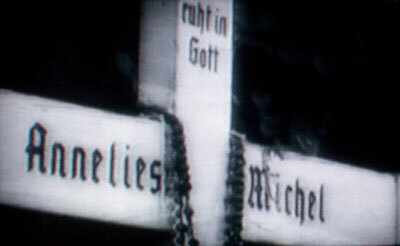 Both men were assigned by the Bishop of Wurzburg, Josef Stangl, to carry out "The Great Exorcism" on Anneliese Michel. The foundation for this ritual was the "Rituale Romanum", which at the time, was still a valid 17th century Cannon Law. Father Arnold Renz had been a former missionary in China, and Pastor Ernst Alt was a pastor in a nearby community. Together they carried out 67 rites of exorcism over a period of 10 months, with one or two exorcism sessions held each week. Some sessions lasted up to four hours (moviesonline.ca). Did Anneliese Michel really see the faces of demons on the people around her like Emily Rose did in the film? Goodman's book includes Anneliese Michel exorcism photos and transcripts. Due to a revived interest following the movie, the book has been republished. This is an opportunity to purchase it while it's still in print. Did Anneliese's mother Anna support the making of the film? How many people were found guilty in Anneliese Michel's death? Anneliese's parents and the exorcists were found guilty of negligence. Is it possible that Anneliese was copying what she had seen in William Friedkin's 1973 film The Exorcist? Director William Friedkin's film The Exorcist was released in Germany in 1974, two years prior to the audio tapings of the exorcisms in which we hear Anneliese's recorded voice (listen below). Even though her voice is quite chilling, it bares a striking resemblance to the growling, barking, and inhuman voice of Linda Blair from Friedkin's film. This has caused some people to conclude that Anneliese was simply mimicking what she had seen in the film, if she had in fact seen the film. Upon its release in Germany, the movie created a sort of paranormal hysteria that swept the nation. European Psychiatrists reported an increase of obsessive ideas among their patients (moviesonline.ca). The movie however, does not provide explanation for the years prior to 1974, in which she was experiencing numerous other afflictions that she and those close to her had attributed to demonic possession. What other disturbing things did Anneliese do? Did the exorcisms cause her bodily harm? The exorcisms took a significant toll on Anneliese's body. Was there a doctor present during the exorcisms as in the film? Goodman based her book on court records and eye-witness accounts. No. Around Easter time of the year that she died, Anneliese began to refuse food and drink. Her convulsions returned with a greater ferocity. No doctors were called (time-proxy.yaga.com). During the trial, specialists claimed that if the four accused (Father Arnold Renz, Pastor Ernst Alt, and the parents) would have begun to force feed Anneliese a week before her death, then she would still be alive. One of Anneliese's sisters explained to the court during the 1978 trial that Anneliese did not want to go to a mental hospital where she would be drugged and forced to eat (moviesonline.ca). In her book, The Exorcism of Anneliese Michel, Felicitas D. Goodman embraces the possibility that Anneliese was not epileptic, and that the medication the doctors had given her to control her seizures only made her hallucinations worse. Why did Anneliese Michel refuse to eat? She forced herself to fast because she believed that it would rid her of Satan's influence. At the time of her death, she weighed only 68 lbs (telegraph.co.uk). Prior to her death, she had spoke of dying to atone for the sins of the wayward youth and apostate priests of the modern church (washingtonpost.com). Anneliese is pictured on the right. What did Anneliese technically die from? 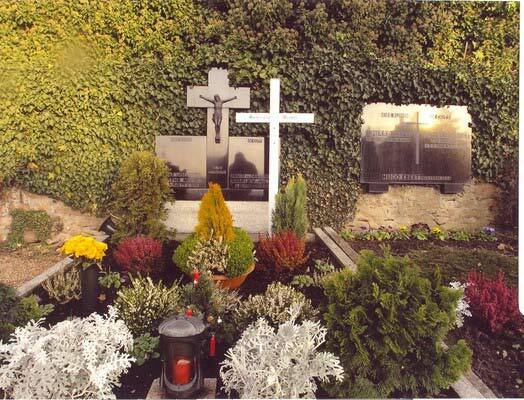 Anneliese's gravesite in Klingenberg Cemetery, Germany. According to the autopsy, on July 1, 1976 Anneliese Michel succumbed to the effects of severe dehydration and malnourishment. At the time of her death, she was also suffering from Pneumonia and a high fever (1g3.com). She was buried next to her illegitimate sister Martha at the outer edges of the cemetery (view here). This area is normally reserved for illegitimate children and suicides (telegraph.co.uk). What were Anneliese Michel's last words? Had Anneliese been a deeply religious person prior to 'being possessed'? Yes. Anneliese and her three sisters were raised in a strict Catholic family. Her father Josef had considered training as a priest and three of her aunts were nuns. Four years before Anneliese was born, her mother gave birth to an illegitimate daughter, Martha. As a result, her mother suffered great shame and was forced to wear a black veil on her wedding day. When Anneliese was a child, her mother encouraged her to atone for the sins of illegitimacy through fervent devotion. When Anneliese's sister Martha died at the age of eight during an operation to remove a kidney tumor, this likely only increased Anneliese's desire to do penance for her mother (telegraph.co.uk). As she grew older, Anneliese continued to suffer for the sins of others. When she was a teenager, Anneliese slept on a bare stone floor to atone for the sins of wayward priests and drug addicts, who could be observed sleeping on the hard ground at the local train station (washingtonpost.com). In college at West Germany's University of Würzburg, she hung pictures of saints on her dorm room walls, kept a holy-water font near the door, and regularly prayed the Rosary (time-proxy.yaga.com). As stated earlier, even close to her death she spoke of dying to atone for the sins of the wayward youth and renegade priests. Is it possible that the priests who performed the exorcisms provided Anneliese with the contents of her psychotic behavior? "Doctrinaire Induction" theorizes that it was the exorcists who provided Anneliese with the basis for her demonic behavior. Some experts believe that this is possible. Psychiatrists who testified during the trial spoke about the "Doctrinaire Induction", which in relation to Anneliese explains that she accepted her behavior as a form of demonic possession, mainly because the exorcists introduced much of the idea to her and reinforced it with each exorcism (moviesonline.ca). In 1984, German bishops and theologians petitioned Rome to change the exorcism rite. They concluded that speaking directly or "imperatively" to the Devil, that is, "I command thee, unclean spirit . . . " only confirms to the patient that they are without a doubt possessed (moviesonline.ca). In the film, did the director try to provide an answer as to whether or not she was truly possessed? I read that the body of Anneliese Michel was exhumed after her death, is this true? Is it true that another movie was made about the exorcism of Anneliese Michel? Watch the Requiem movie trailer. At the time of the release of The Exorcism of Emily Rose, a German web site posted audio in which we hear the real Anneliese Michel's voice during one of the exorcisms. The web site obtained the audio from one of the 43 taped recordings made during the 67 rites of exorcism that Anneliese endured for a period of 10 months. The commentators in the clips can be heard talking about the demons Cain, Nero, and Hitler, who Anneliese believed had taken over her body. 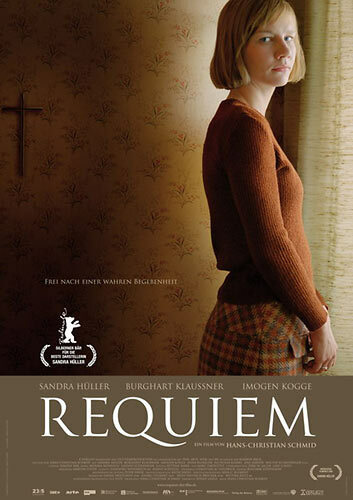 View the movie's trailer in addition to the trailer for Requiem, the non-horror German film about Anneliese.